Bromsgrove has a very typically British high street at the moment. The only things that can survive are the charity shops, the cheap shops and the boutique shops. This suits me fine as I help out in the charity shop (Oxfam as usual), get my cheap lunch from the cheap shops, and then treat myself to nice things from the specialists. Today is one of those treats as we popped into Lorita's Bakehouse (https://twitter.com/LoritasBakehous) for our lunch, and then decided that we could have some cakes for the afternoon too. I don;t think I'd been in before as it's a few doors further than my usual place to sit and hide with TeaPigs and a hot sandwich, but it's good to try new places. Both were very busy due to the rainy Saturday afternoon weather. And I mean - who could pass up this selection! 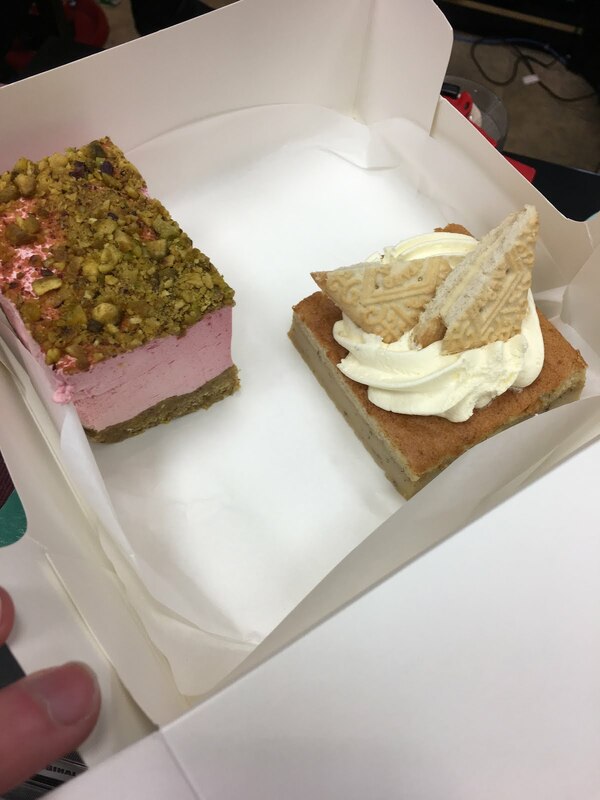 There is nothing on display here that I would have turned down, but after the amazing red marshmallow sensation last week I decided I'd take a slice of the raspberry and pistachio cheesecake and one of the banana custard slice. We did share them between three of us (OK so I ate the most...)! 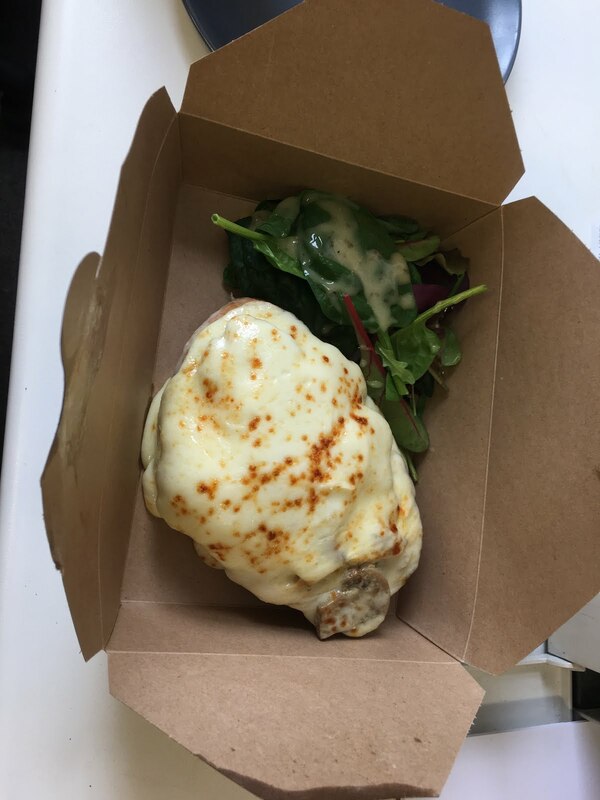 My partner's dirty cheese toasty is also worth an honourable mention - it was huge! My smaller ciabatta was exactly what I needed, hot and tasty. We took the cakes back to our shop and over the afternoon picked away at them. A big problem with pretty puddings is that they never taste as good as they look, especially cupcakes, but here they are both as close as you can get. I mean nothing could taste as good as the raspberry cheesecake looks, I don't think that's possible. On a bite per bite basis maybe the dark choc marshmallow bar was more to my taste, but this is a huge chunk of pudding and the milder, creamier flavour suits it more. It's kind of like a milk jelly really, and actually tastes of pink (if that makes any sense). The base is really well flavoured and the texture is soft but crumbly too. 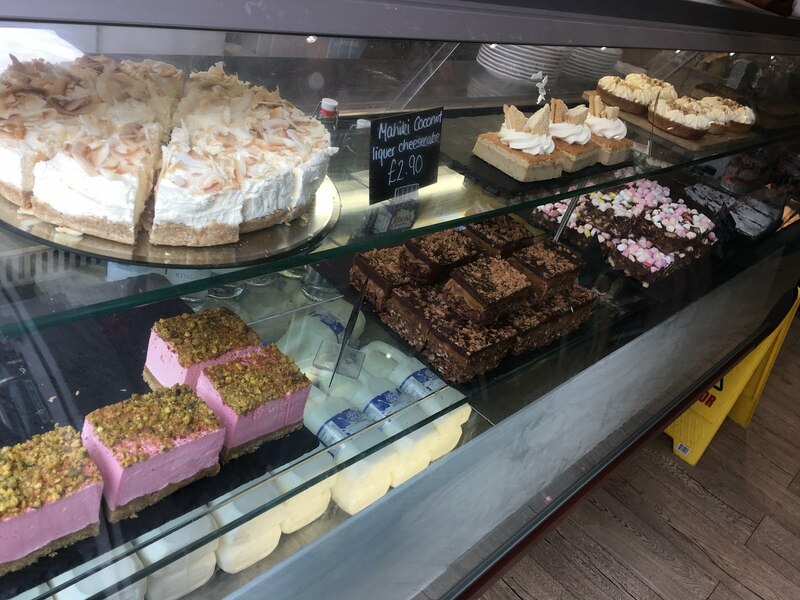 Believe it or not though the banana custard slice was my favourite. I loved this all, from the cunning use of the biscuits on the top (which naturally had gone a bit soft due to the moisture of the cream) to the real banana flavour of the base. It wasn't too sweet and had quite a deep, earthy taste which I loved. I could imagine cutting the base into 9 little squares and having them next to a luxury coffee while the rain hammers on the cafe windows. So, another place to add to the list of local cafe's to grab interesting things from when in Bromsgrove. It's going to be hard to resist popping in again in two weeks time.